Now that my time is my own again I have begun cleaning up and organizing the crafting supplies again. This is going to take a great effort to clean up. Since getting the flu twice I have not recovered the little energy I usually have. Working on tree ornaments has meant dragging all types of supplies out and now I cannot find anything. Right before decorating the Asian style tree I decided to add a necklace to the gifts. I had been planning the necklace for a while but couldn't find the stones I wanted. In the end I decided on these amazonite 4 mm stones in pale and medium blue green shades. Then I added A quality rice shaped pearls and 3 and 4mm clear crystals. The patterns of the strands were based on odd number and I made three different strands. Close up of amazonite necklace crystal drop. Finally I added a large odd shaped crystal drop. The crystal had two holes so that it could be added directly into a necklace. To hide the second whole I added wire wrapping to the crystal. The necklace is really beautiful and was a bit of a wrench to give it away. In the end it was placed on the red dress, I hope whoever gets the necklace will like it. 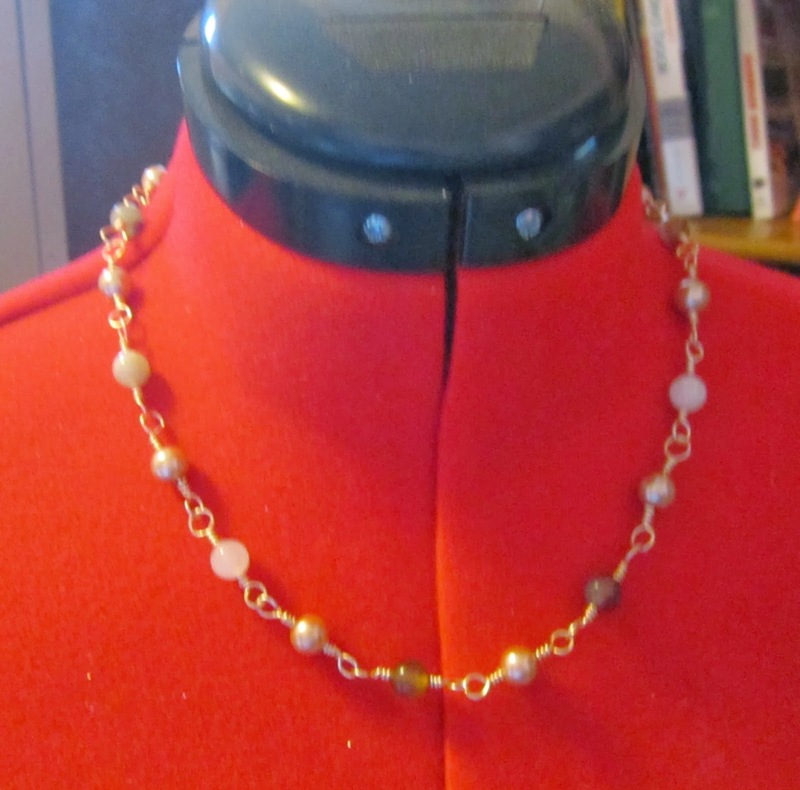 After hurting my left wrist last year I had stopped making jewelry to give it time to heal. So it was fun making jewelry again. Here is a picture of the necklace I made for the Marie tree. 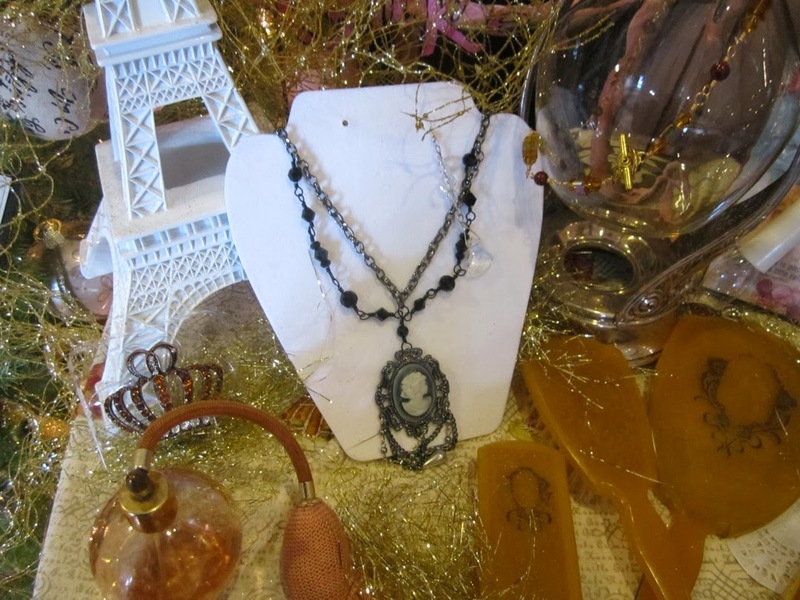 Necklace gift for Marie Antoinette tree. The cameo was from Michael's craft store. The whole piece is quite large. I hung the cameo from a thick chain and then wired some black crystals to drape on either side of the necklace. The person who got this tree said they really liked it. By a strange chance the Monday after Elks tree festival the woman who got the Marie tree stopped at Beverly's to get some pink decorating supplies. Even stranger Linda was the person checking her out. Linda asked her what she was making and the woman explained how she had gotten a beautiful tree at the Elks. She also said that the tree was made by the people at Betty's Fabric. Linda said that it wasn't made by Betty's and the woman asked how she knew this. Then Linda explained about our merry little ban of crafters that made the tree decorations. The woman was impressed by all the work and thanked Linda for the tree. The really great thing about meeting her we got to find out what she was going to do with the tree. The tree was a present for her daughter who is a Christmas baby. She is going to have a Christmas tea birthday party and is going to serve out of the silver coffee server. Sounds like it will be a very beautiful party. The woman is going to keep the 17th century party lithograph for her work room. She makes period costumes! I can't think of anyone who could have enjoyed the tree and gifts more. So back to the cleaning and sorting. The beads are everywhere right now and I was sorting through them when I saw some of the lovely green opals and Italian marble. So next thing I know, instead of sorting I'm making more jewelry! 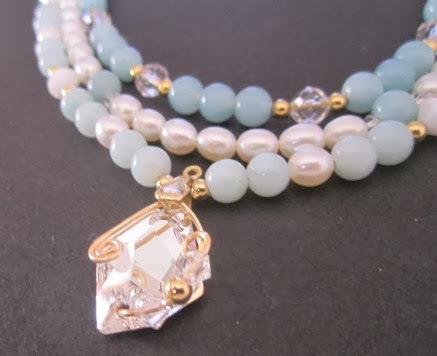 Italian marble beads and golden pearls. 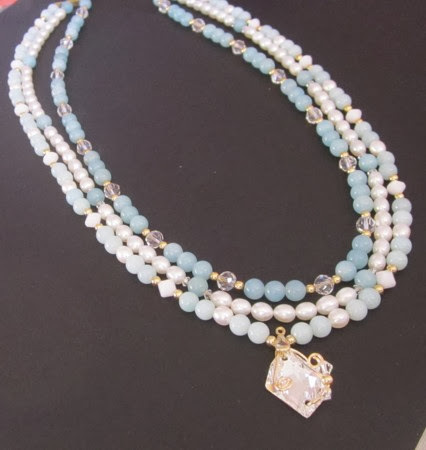 The Italian marble necklace is made 8 mm marble beads in fall colors, specifically the colors found in grapes and opaque white marble. The beads are wired together with a rosy colored brass. 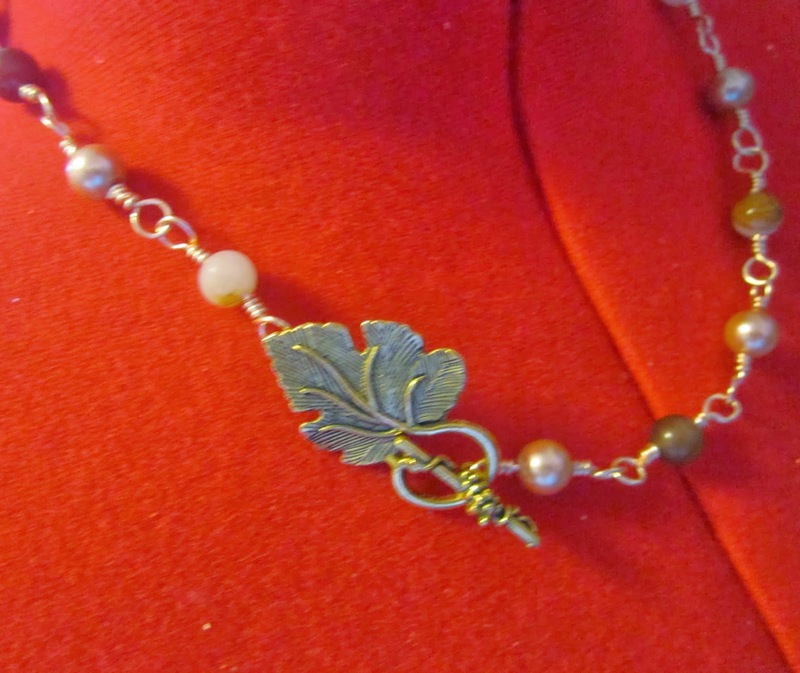 The colors look great with the large leaf clasp. Next I made a more complex necklace. 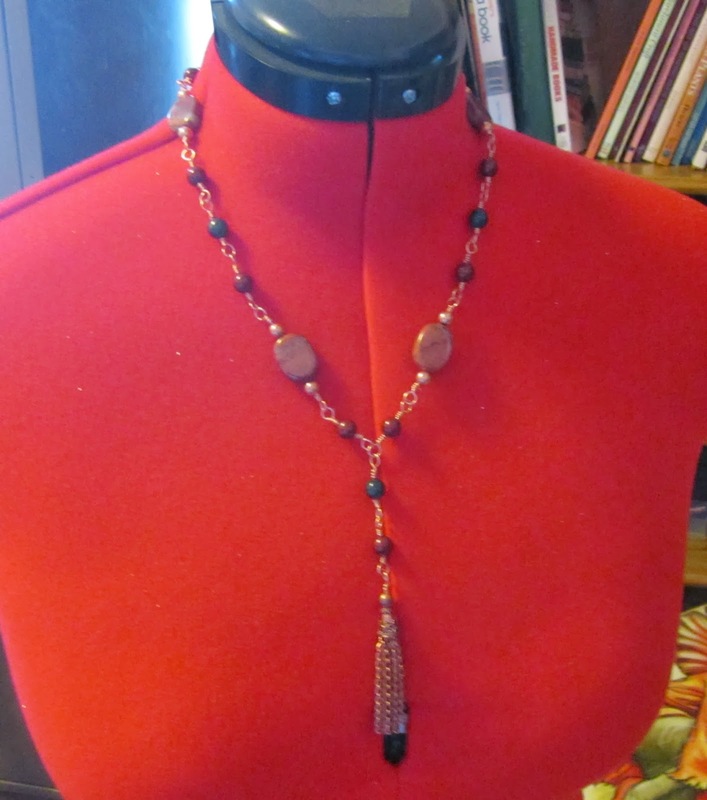 Using 20 gauge copper wire the necklace was wired together using poppy jasper, burgundy crystal pearls copper beads and bloodstone. 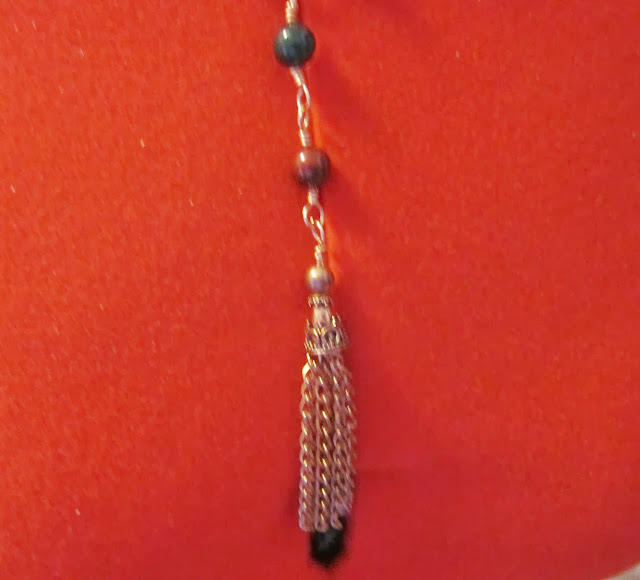 In the middle of the necklace I made a drop of burgundy crystal pearls and bloodstone and attached a tassel made from copper chain and a bead cap. Burgundy crystal pearls, poppy jasper, blood stone and copper wire and beads.